Borobudur Temple Compounds is a term used by the World Heritage designation of the area of 3 Buddhist temples in Central Java, Indonesia. 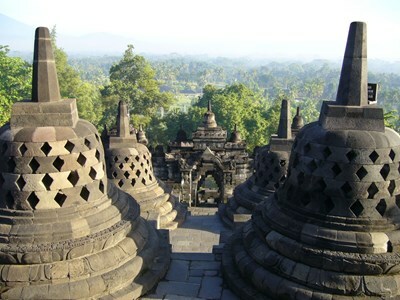 It comprises of Borobudur, Mendut, and Pawon. These 3 temples are located in a straight line, and have been considered as being built during the Sailendra dynasty (8th–9th centuries). File:Borobudur-Pawon-Mendut. png Location three Buddhist temples, Borobudur-Pawon-Mendut, in one straight line. File:Mendut Temple Afternoon. jpg Mendut Temple. File:Pawon. This description uses material from the Wikipedia article on Borobudur Temple Compounds and is licensed under the Creative Commons Attribution-ShareAlike License (view authors).